The Duomo is Florence’s most famous architectural sites, and one of Italy’s most majestic cathedrals. Every detail of the building is so magnificent, you could honestly spend days just looking at the exterior. The construction of the Duomo took approximately 140 years, with the dome itself taking about 300 (the people who started building it never got to see their work complete – even their grandchildren didn’t!). It really is an architectural marvel to see, for those of you who care at all about architecture. You see, usually the cathedral is only open to the public at certain times; generally speaking from 10 am – 5 pm. There are few tourists who get to visit the Duomo at night – luckily I was one of them. 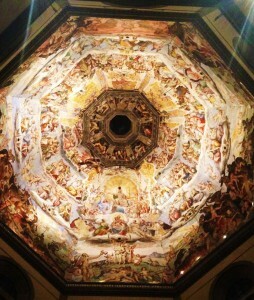 I was told about a free opera one night which was to take place at the Duomo. Even if you’re not an opera fan (I have to be because my grandmother is an opera singer) it’s hard to say no to listening to a group of extremely talented people giving it their all at one of the most magnificent historical sites in Italy. My boyfriend and I were on our way to a bar to meet with some friends and decided to pop by the opera on our way – just to be able to say that we’ve done it and to get a free glimpse inside the Duomo (usually you would pay €10-€15 for entry) – yes we were broke enough to care. Well things didn’t turn out quite as we planned because once we stepped inside and witnessed what was before us – we were both completely enchanted. Needless to say we stayed for the whole concert. Now I’ve seen and heard many beautiful things in my lifetime. But this… This was haunting. I can still hear the songs the choir was singing vividly echoing in my mind if I try. We left this performance in complete awe. I had never been quite so enamored by surprise before. There is only one reason that travelers don’t get to witness things like this on the regular – they don’t know where to look. My tip to you is: look past the obvious. If you’re in Florence a great Website to find out about unique events happening throughout the city is: http://www.polomuseale.firenze.it/en/index.php. You would be surprised how many things you can do for free. You’d also be surprised how many hidden surprises there are even in the smallest of cities – the best cultural moments don’t always happen in the biggest tourist attraction – actually, they usually don’t. Go out of your way to see the city how someone local might see it. You will get a completely different feel for it than you do as a tourist.